'Till Death' (Deep Six Security Series, Book 1) by Becky McGraw is a fantastic story! This is a great start to this series. This book is full of action, passion and parts will have you absolutely cracking up! I absolutely freaking loved this story! I loved getting to know about Dave, Susan and the others at Deep Six Security. Can't wait to see what happens next in this awesome new series! Highly recommend this amazing story! Alpha male meets his match! Lots of action, sizzling romance - what more could you wants? 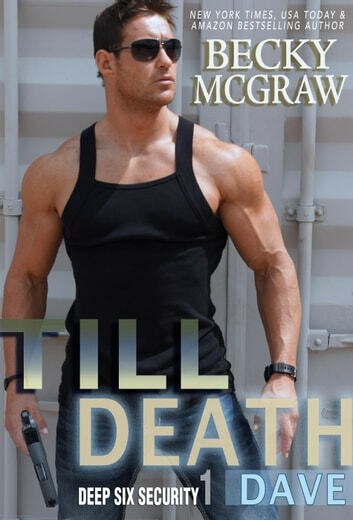 I enjoyed this book as I like the alpha male security type stories - and this one had the bonus of a alpha female as well! The relationship between them was explosive - and we all knew where that was heading..........I thought the 'rescue' scenes were a bit simplistic and could have had more action or more inter-action with the 'baddies' and thought the back story a little weak, but overall, I enjoyed it. Didn't take long to read - just one lazy afternoon. Fantastic first book in this series!!! This is such a good read. It is pretty full on. The relationship between Susan and Dave is very spicy and very funny at times. The atmosphere between them is electric. Good read.